Defensive or Offensive Returns of Short Serves. I returned late last night from the South Shore Open in Indiana - an 11-hour drive. I have a lot to write about it, but I've also got a todo list that goes from here to Pluto. So I'm going to write about some other stuff today (the Tip of the Week and Men's World Cup - mostly linking to articles about it), catch up on other things, and write about the South Shore Open tomorrow. Here are the results of the tournament, care of Omnipong. Great performances by Samson Dubina, the Seemillers (Dan Sr., Dan Jr., and Randy), Nathan Hsu, and others! It finished on Sunday, with Zhang Jike defeating Ma Long in the all-Chinese final. In the semifinals Germany's Timo Boll went seven games with Zhang, while Ma defeated Japan's Jun Mizutani 4-0. So Boll came close to breaking the near-Chinese lock on many of these events. Here's the ITTF Men's World Cup page, with results, articles, and pictures. Here's the ITTF article on USA's Kanak Jha, the youngest player ever to qualify for the World Cup. However, the news of the event was Zhang's reaction to winning, where he celebrating by kicking and destroying barriers! As a result, the ITTF penalized him the entire $45,000 in prize money he'd just won. Here's the video (27 sec). Here's another video of it (45 sec), from a different angle. Here's a picture from a newspaper. Here's the ITTF's press release, "Zhang Jike Wins ITTF Men's World Cup Amid controversy." Here's Matt Hetherington's blog on this, "ITTF Fine on Zhang Jike No Less Than Absurd." (I haven't had time to really investigate this, but I pretty much agree with Matt and most others on this that the penalty was excessive - as Matt writes, a $5000 fine might be about right.) Here's extensive discussion on this at the Mytabletennis forum. Zhang issued a statement, saying, "No matter what kind of honour I won today, I didn't handle my celebration with calmness and rationality. For a long time, I have been withstanding a lot of pressure but I shouldn't bring such mood into the arena. I didn't consider the impact on the team and the event itself. I apologise to everyone." And here's Mike Mezyan's cartoon artwork on Zhang Jike's barrier breaking! It started yesterday in Barbados, after three days of training. Here's the ITTF page with results, articles, and pictures. USA players competing (on the North American team, combined with Canada) are Kanak Jha (who flew in from the World Cup), Jack Wang, Crystal Wang, and Amy Wang. Crystal was featured in an ITTF article. Here's the video (48 sec) - I want one of these! And you should want a serve like this. Here's the article from Expert Table Tennis. Here's the video (2:41). It's both an exhibition trick and something you should learn to do to help develop your serves. If you can't do tricks with your serves, they can't be very tricky, can they? I do this same trick in clinics, though I usually have someone put their racket on the side of the table and spin the ball one way so that it curves back and bounces on the paddle. Ask the Coach and Should Zhang Jike Keep His Prize Money? Here's the latest Ask the Coach feature from PingSkills, Episode 16 (12:10). Below are the questions. At the end they ask the question on whether Zhang Jike should keep his $45,000 prize money from the Men's World Cup after his barrier-destroying episode. You can see the responses underneath. Question 5: What is the best penhold rubber mark? PingSkillers Question of the Day: Should Zhang Jike receive his prize money for winning the World Cup? As some readers might have figured out, Nathan is back in the U.S. (he just won 18 & Under and Under 2450 and made the QF of the Open at the South Shore Open), but he's editing these videos from his three months training there starting in July. Here's the latest episode - Quadricycle!? - China Day 48 Part 2 (10:00). I have no idea if this "sandwich" racket is legal, but I sure want one! Here's 32 seconds of Jan-Ove Waldner and Mikael Appelgren doing an exhibition for a law firm. Table Tennis TV Comedy - "The Kings of Queens"
In my last blog I linked to a "German" TV comedy that featured table tennis. However, as emailed to me by Grant Vogl, it turns out the clip was actually from the TV show "The Kings of Queens," which ran on CBS from 1998-2007. The original was in English, which was dubbed in German in the version linked before. Here's the original in English - the table tennis starts at 1:11. Grant also explained that the clip was from Season 6, Episode 3, titled "King Pong (20:39). Earlier in the show (as Grant emailed), Arthur (Doug's father-in-law) surprises Doug with his ping-pong prowess (1:36). Later on, Carrie (Doug's wife) defeats Doug and Doug then asks Arthur to train him. This leads to Arthur training Doug to use a wooden spoon (1:49) so that "the paddle will seem like the size of Texas." Ultimately, Doug defeats Carrie in glorious fashion. However, as shown in the episode, Carrie later proves to Doug that she was just letting him win. Doug has a hard time dealing with this, declares that the ping-pong issue is "gonna ruin everything," and in the humor of the show, considers the possibility that it will lead to divorce unless Doug defeats Carrie "for real." WETA TV came to MDTTC for about four hours yesterday to do a documentary on us online – I'll blog about it when it's up. 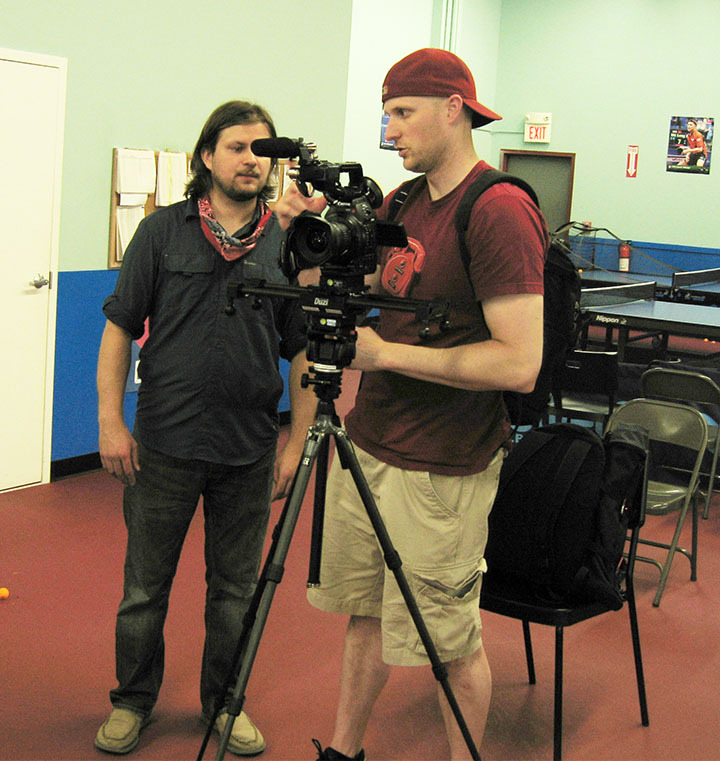 Here's a picture of two of the crew members (there were three of them) as they film us, and here's a picture of them filming Derek Nie and Crystal Wang. It was a long day. I normally coach Sunday mornings but I was off due to students studying for final exams, and so I had no coaching until 3PM. So I became their chaperone. We had arranged for them to come Sunday at 11AM so they could see some of our top juniors in a group session, and then our Elite League at 12:30 PM. They filmed Derek and Crystal, as well as Nathan Hsu and many others, often from a distance so the player didn't even know they were being filmed. Other times they'd go out on the court and get close-ups. I was hoping to highlight as many players as possible, from our top juniors to our seniors, including Charlene Liu, who recently returned from New Zealand with a bronze for Over 60 Women's Singles. (She also won Over 60 Women's Title at the Nationals and many more in age groups from over 30 to over 60.) However, they told me they could only focus on one or two players. They also didn't want to interview players and then disappoint the player by not using the interview, which is understandable. They did interviews with Crystal, Derek, and me. My interview was the longest interview I've ever done. It went on for about an hour as they asked question after question. Part of the reason it took so long as I gave rather long answers. Since they'll end up condensing all this to about four minutes, it'll be interesting which parts they decide to use. In answer to their questions, I elaborated on my background, the kids, MDTTC and its history, our coaches and players, training centers, China, what it takes to be a top player, and much more. Now the downside. Before they interviewed me they filmed me using the robot. I put it on full speed so the balls were just shooting out as I smashed forehands. I had no trouble doing this at first, but they wanted to get lots of shots from all angles, and so it went on and On and ON!!! Soon my arm and shoulder began to tire, and then hurt, and still they kept filming. I felt my knees and legs begin to go, but still we went on. After the longest time, and after they'd filmed both me and the robot from all possible angles, they said they had enough. They asked if I had anything else interesting I could show them. They filmed me doing my ball-blowing trick, where I not only blow the ball in the air, but to the side, balancing it in the air by spinning the top of the ball with my breath. Then I demonstrated my 50-foot serve, where I served from 50 feet away from the table, and directly to the side of it (so I'm lined up with the net). I do this by putting a great amount of sidespin on the ball, and made it on the first try. They wanted several more, so I ended up doing about ten of them. The problem – this put more strain on my shoulder, as these 50-foot serves are very physical. So now I'm full of these minor injuries – every part of my legs are aching, one knee is bothering me (it was bothering me before, but this aggravated it), and my shoulder is hurting from the robot play. Hopefully it just needs a couple days rest – and fortunately I've got a very light schedule today and tomorrow. We'll see how it is on Wednesday. Former USATT President Sheri Pittman Cioroslan is doing an article every day during the last 100 days of Adham Sharara's ITTF presidency. I linked to the first five last week, and there are four more. So I compiled all nine here. Nine down, 91 to go! Day 96: Striving to Attain 225 Affiliated National Associations: It’s in Our Blood! No, not the book (though you should buy that! ), but the Tips now up at Expert Table Tennis – there are now 25 of them. Here's a short article on this. Here's the article in the New York Post. Here's a video (51 sec) of all-time greats Jan-Ove Waldner and Jorgen Persson doing some pretty spectacular tricks with the ball and racket. Notice that the second half is all done continuously. Why don't you try to copy some of these tricks? Good luck!!! Here's a screen shot of Dr. House from an episode of the TV show House playing table tennis – with a clipboard!!! I'll be away the next five days, Wednesday to late Sunday night (Jan. 8-12), going to my nephew's wedding and family gathering in New Orleans. So no blog until next Tuesday. (I'll also put the Tip of the Week up on Tuesday.) At that point things get exciting - USATT Historian Tim Boggan moves in with me on Monday, and we begin the grueling two-week task of doing the photo work and layouts for Volume 14 of his History of U.S. Table Tennis, as I've done with the previous volumes. USATT just completed a special election for the open seat vacated by Christian Lillieroos. Here's the announcement - Jim McQueen wins over Ross Brown. Here's the USATT Board of Directors listing. Just as she did as a 9-year-old (with a 2150 ratings) and a 10-year-old (with a 2355 rating), Crystal Wang just set the all-time record for highest rating for an 11-year-old, boys or girls, with a 2402 rating after the North American Teams. Alas, it didn't last - at the USA Nationals, where she became the youngest ever to win Under 22 Women (beating in the semifinals soon-to-be three-time USA Women's Singles Champion Ariel Hsing), she sort of imploded in Under 18 Girls' Singles with several huge rating losses, and so came out at 2304. Suffice to say that few who play her think of her as "only" 2304. Wins: 2359, 2356, 2348, 2345, 2315, 2305, 2304, 2289, 2277, 2276, 2262, 2247, 2134, 2059, 2012. Losses: 2781, 2542, 2394, 2325, 2305. Crystal has been chasing after Kanak Jha's records for the last few years. Kanak, 13, set the record for highest rated 9-, 10-, 11-, 12-, and now 13-year-old in history, with Crystal breaking the first three. (Kanak's highest ratings at age 9, 10, 11, 12, and 13 were 2017, 2265, 2366, 2468, and 2635. This last one especially is going to be tough for anyone to top! Note - I'm not absolutely certain Kanak's 2017 rating at age 9 was the record, but I think it was.) The two are leading a huge surge in elite cadet players in the U.S., which is stronger than it's ever been. Just for the record, both Crystal and Kanak are U.S.-born citizens. I had a listing of Kanak's highest ratings at each age, and now I can't find it, alas - but I know his highest as an 11-year-old was somewhere in the 2350 range, which is still incredible. At the USA Nationals, Klaus Wood, 12, went from 637 to 1747, a gain of 1110 points, which I believe might be a record. If anyone's gained that many in a tournament, let me know. At worse, it's probably a record for the Nationals. The amazing thing is that's way, way too low for him. Just look at his results - he beat players rated 2261, 2068, 1906, and 1892, and his worst loss was to a 2132 player in five games! He's really 2100+. But his 637 rating was from 2009. Here's his story: he started out as a 9-year-old at the Maryland Table Tennis Center in 2009 (my club), and played five tournaments that year, getting that 637 rating. I coached him a number of times that year in group sessions. Then his father got a job in Taiwan, and so he moved there and spent the last four years there training. (He's half Chinese.) He came back to Maryland for a time this summer and attended two of our camps. Then he attended the USA Nationals. He's back in Taiwan again, but he's supposed to return to Maryland permanently later this year. We look forward to having him back. I've added two new clubs to the list I maintain of full-time table tennis centers in the U.S.; there are now 67 on my list. The new ones are the Zaman TTC in Westminster, CA, and the Washington TTC in Gaithersburg, MD. Let me know if there are any I've missed. I'm sure there are a few out there that I don't know about. One rule - the club needs a web page in order to be listed. There are full-time centers in 23 states. The leaders are California with 20 and New York with 12. After that it drops down to four in Maryland and Texas, and three in Georgia and Oregon, and two in Illinois, Massachusetts, New Jersey, and Pennsylvania. States without a full-time center (in order of population) are MI, TN, MO, WI, CO, AL, SC, LA, KY, OK, CT, IA, MS, AR, KS, NE, WV, ID, HI, ME, NH, MT, DE, SD, AK, ND, VT, AND WY. I was curious as to how they match up if you divide the state's population by the number of centers, and here's what I found, with number of full-time centers in parenthesis. Here's a growing step-by-step guide to playing table tennis. Not all the segments are complete, but it's halfway - nine articles done, nine to go! Here's video (41 sec) of Adam Bobrow winning a match in Vietnam with a spectacular around-the-net backhand counter-smash winner. I'm off to the Hopes Trials in at the Westchester TTC in Pleasantville, New York. See you on Monday! I'm going up to coach the two Maryland players who qualified, Crystal Wang and Derek Nie. We've been training for this for weeks! I did a 90-minute session with Derek just last night, while other coaches worked with Crystal. What is it? Having trouble smashing against medium-high balls, or (for more advanced players) low topspin balls? One of the keys is to have the exact same backswing every time. Here's a way to learn to do that, as shown to one of my students last night. This is also how I developed my smash many years ago. First, do a few smashes with someone (ideally have them feed multiball, or just serve topspin, they return the ball, and you smash), and when you make good ones, note where you backswing to. The question is how to repeat this over and over? Go near a wall and shadow practice the shot. Do your backswing just like you did in the good smashes. Then find a mark on the wall and move so the mark is just above where your racket is when you backswing. (You might have to put a mark on the wall yourself, alas.) Once you've done this, you can backswing to that same spot over and over. Get a feel for where the backswing should be. If you do this enough, it'll become so automatic that backswinging any other way will feel awkward. Ryu Seungmin Out Of Paris 2013! China Confirmed Players For Paris 2013! Here's a new video (1:54) of some nice exhibition play between Jan-Ove Waldner and Jorgen Persson, with Dan Seemiller giving animated commentary. Here's a new video (25 sec) of someone getting smacked in the face by an opponent's mis-hit smash. Shown in slow motion! Maybe they Hopes Trials should be held on these tables? The sponge was going somewhat dead, so I lent him a sheet of a used looping sponge. His first few shots went off the end. Then he adjusted by closing his racket more, meaning he hit more on top of the ball - instant topspin!!! It was a simple as that. Later, when I fed him multiball, his backhand loop was also vastly improved. You can put topspin on the ball with a hitting sponge, but the looping sponge made him do so, leading to a much better backhand. While he doesn't need the most high-end (i.e. most expensive) looping sponges, it's becoming more and more important for players to use modern looping sponges even if you aren't using it primarily to loop. They are just bouncier, and make it easier to rally at high speeds. The "New Modern Backhand" at the higher levels isn't much like the normal backhand of the past. Just watch, say, Ariel Hsing and Lily Zhang, the USA Women's Singles Finalists the last three years, and see how they backhand topspin the ball right off the bounce even when warming up. It's basically an off-the-bounce loop, and it's not a shot they "go for" - it's their standard backhand. The same is true of developing players all over the world if they have modern coaches. At our club, we tend to teach juniors to topspin the backhand like this starting when they are around 1500 or so. Here's a video of Ariel and Lily playing the Women's Singles Final in 2011. They begin hitting backhand to backhand at 1:48 - watch closely how they both are topspinning off the bounce. Go to 2:04 and you see a closeup of Ariel's backhand - see that incredibly fast movement as she topspins the ball? I think you get an even better view starting at 2:19. I've served on the USATT Coaching, Club, and Editorial Committees for a while. (Back in the 90s I chaired the Coaching and Club committees.) However, the letter below (sent to the USATT Board of Directors, Staff, and those three committee chairs) explains my resignation from all three. After much contemplation, I've finally decided that I'm just too busy to really contribute as a member of a USATT Advisory Committee. I'm currently trying to coach full-time, run training camps, promote and organize table tennis at MDTTC, run tournaments, write a daily blog and weekly feature articles, write books on table tennis, update numerous TT web pages, as well as recurring projects such as the page layouts and photo work on Tim Boggan's TT history books and many other items. I'm also working on a science fiction & fantasy writing career. And sometimes I like to find time to eat and sleep, a rare luxury these days. When I agreed to join the USATT Editorial, Coaching, and Club Committees, I told the chairs that I wouldn't be able to put in the hours I used to due to these other commitments, but the amount of time I have free for these activities has now gone negative. With two of these committee chairs leaving due to term limits (a bad idea, in my opinion, since greatness often comes from the hard work of uniquely qualified individuals - though of course there are good arguments for term limits as well) this seems a good time for me to turn in my resignation from all three committees. The incoming chairs should generally be able to choose their own committee personnel. I think all three chairs have done excellent jobs, and I wish them and their successors well. Here's an article by Yahao Zhang on choosing equipment. He's the reigning U.S. Under 21 Champion as well as the Southern Open Doubles Champion with Nathan Hsu - I coached them during those matches. Here's a video from PingSkills (1:51) on where to put the index finger on the forehand pendulum serve to maximize spin. Here's a one-hour video of five-time U.S. Men's Singles Champion and two-time Olympian Sean O'Neill as he gives a clinic at Univ. of Virginia. No flashy graphics, just content. Here's an old video (1:59, circa 1950s?) showing the game of "Smash," where players hit off an adjusted backboard. Two-time World Men's Singles Champion Johnny Leach and two-time World Women's Doubles Champion Diane Rowe are featured in the video.